A true team effort resulted in victory for the Outlaws girls cross-country team last week. They easily won Division Four of the Seaside Three Course Challenge held Saturday, September 17 at Camp Rilea. Divisions are made up according to school population, since teams come from other states besides Oregon. In all, more than 80 teams took part in the meet including many from Washington and even a few from California. In its 26th year, the Three Course Challenge is one of the largest cross-country events on the West Coast. The Three Course Challenge requires that varsity runners draw poker chips randomly from a can – with white designating the easy course, blue moderate, and red difficult. Points are added from the results from all three races to determine team winners. Sophie Borders set the tone for the day with a very strong showing in the easy course, which was approximately 4,500 meters. 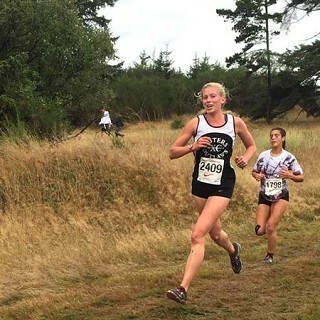 She cruised to eighth place overall and second among runners in Division Four with a time of 19:40. Engracia Diez was the other scorer for the Outlaws, finishing in 34th place in 21:20 among 268 finishers. The moderate race included 301 girls, and the Outlaws fared well in the large field of runners. Anna Bartlett placed 26th (24:28) and Amy Hills came through in 67th (26:12) on the toughest course they will see this season. However, sophomores Tate Ricker and Molly Winter faced an even more challenging course, working their way through the steep sandy hills and the muddy bog to clinch the win for Sisters. Ricker placed 52nd (26:39) and Winter 88th (28:07) among 268 finishers. Jordan Pollard nearly kept his winning streak alive with an impressive second-place finish in the boys easy race as he lead the team to a seventh-place finish in Division Four. Jackson Bowe was the second scorer for Sisters with a time of 19:48. Cole Pade led the way in the moderate course, finishing fortieth out of 429 racers in 20:55. Will Werts finished in 23:47. Freshman Josh Liddell cracked the top 100 in the difficult course, placing 99th in 23:01 among over 400 runners. Jack Berg crossed the line in 25:45 to complete the scoring for the Outlaws. Eleven Sisters Middle School students made the trip as well, highlighted by Ethan Hosang’s win in the 3,000-meter middle school competition. Hosang held on to a two-second win in 10:43 after taking the lead coming out of the mud pit mid-way through the race. The Outlaws travel to Portland Saturday, September 24, for the Nike Portland XC meet that attracts schools of all classifications from throughout Oregon.